More than 19,000 attendees are expected to gather on Feb. 5-7, 2019, at the Anaheim Convention Center in Anaheim, Calif. for the ATX West manufacturing trade show. Joining the attendees will be more than 1,900 exhibitors in the manufacturing space displaying the latest technologies in automation across the entire product cycle. At the show (booth #5095), the company will demonstrate its pick-and-place automation, and mobile robots will show how customers can “meet growing demands for product transfer customization without reconfiguring an entire equipment line. 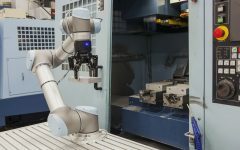 The company will also show off its latest collaborative robots that can be used alongside humans in machine tending, loading/unloading, assembly, screw driving, gluing, testing, and soldering applications. The new cobots can be trained through a manual teaching function that lets operators to teach the robots through hand-guidance, OMRON said. Epson Robots will showcase its robots, including the 6-Axis- and Synthis T-Series All-in-One SCARA robots at booth #4211 at ATX West. The Synthis T-Series All-in-One SCARA robots include a built-in controller, a new feature that reduces space requirements, and the Epson RC+ development environment. The robot will be shown with Vision Guide, demonstrating inspection and pick-and-place applications with vision guidance. The company’s 6-Axis robots are aimed to reach into confined workspaces, with payloads ranging from 2kg to 8kg, and a reach of 450 to 1,400mm. The Flexion N2 6-Axis robot features a folding arm design, which was awarded the Thomas Edison 2018 Innovation Award. MDX Integrated Servo Motors, which combine high torque density, low inertia servo motors with on-board drives and controllers to create all-in-one integrated motor solutions to save on space, wiring, and costs. StepSERVO Integrated Motors, which provide high-torque motion control for high throughput applications, such as packaging and labeling, automated test and measurement, and automated assembly. STF Stepper Drives that support industrial Ethernet and Fieldbus network protocols, including EtherCAT, EtherNet/IP, CANopen, Modbus, Ethernet, and RS-485. The company said system designers and machine builders can use the stepper drives to control step motors using the network protocol of their choice. Robotics Business Review has its own event as part of ATX West. On Tuesday, Feb. 5, join a bunch of speakers at the CRO Summit at ATX West, in which topics concerning the deployment of robotics and automation in manufacturing environments will be discussed. Be sure to check out the session “New Technology Applications: What Does This Mean for the Next Generation of Robots”, which starts at 4:45 p.m. Speakers from the Advanced Robotics for Manufacturing (ARM) Institute, Yaskawa America, the University of Southern California, and the United Technologies Research Center will discuss the latest advances, including whether robots will be able to program themselves in manufacturing environments. Satyandra K. Gupta, a professor of mechanical engineering & computer science at USC, plans to discuss new robotics application, including how a robot can perform sanding applications. As previously noted on this site, Universal Robots and VersaBuilt will be at the show, demonstrating its new URCap interface, which can execute any machine program stored on a CNC machine tending system. At the new Tech Base Camp, attendees can “explore the most cutting-edge end product technology out there,” including companies Bend Labs, Haddington Dynamics, VRingeers, Mira Labs, Xtremity, and The World of Sentient Beings Company (Reach SAI). Solve a series of puzzles and beat the clock at the MD&M Escape Room, in a special medtech-themed escape room. The room is designed for beginners and escape room enthusiasts, with completion time estimated between 15-20 minutes. A Super Soaker shooting range is being set up outside the main entrance. The display will honor the 2019 Golden Mousetraps Lifetime Achievement Award Winner, Dr. Lonnie Johnson, inventor of the Super Soaker. The Golden Mousetrap Awards itself will be held on Tuesday, Feb. 5, from 5 to 7 p.m. on the Center Stage area.